Overall life expectancy for Americans was 78.6 years in 2017, a drop of 0.1 year. That may not seem like much, but usually, life expectancy goes up a little each year. If it goes down, it means people are dying at younger ages. The death rates are driven mostly by a startling 9.6 percent increase in drug overdose deaths, from 63,632 in 2016, to 70,237 in 2017. 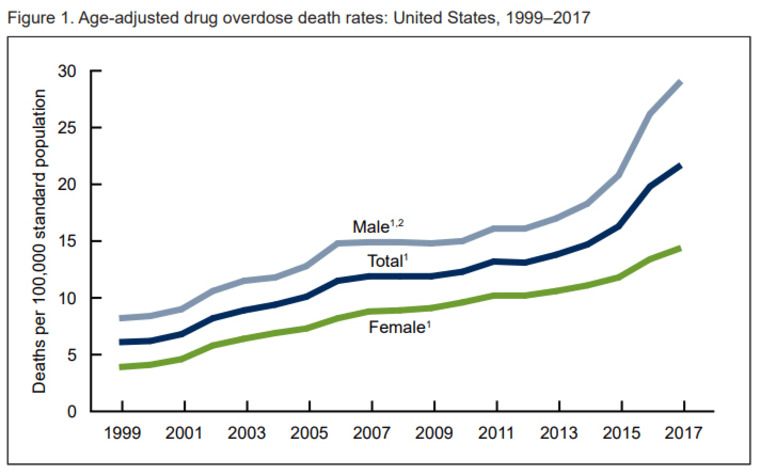 Most of the overdoses involved opioids of some sort, and the CDC's National Center for Health Statistics recorded a 45 percent increase in deaths from synthetic opioids such as fentanyl and tramadol. They accounted for nearly 30,000 of the 70,000+ drug overdose deaths.